In a world still characterized by four-digit telephone numbers, 78 rpm records, and vacuum tubes that had to be carried to the hardware store for testing when the radio or television wouldn’t work, my first camera fit right in. Learning to coax images from photographic film was an even more complex and fascinating process. My friends and I spent hours in our high school darkroom, a place whose conditions suggested nothing so much as the possibility of suffocation. Lit by the glow of dim red lamps, shallow pans containing an array of chemical solutions marched across tables and counters. We spoke their names in hushed tones, like incantations — developer, stop bath, fixer — and hung our bits of paper like batches of tiny, magical laundry still dripping water and solution while a pervasive, vinegar-like tang flavored the air. Despite our sense of exploring uncharted territory, we were only the latest in a long line of image-makers. We experimented with photography as a way to earn extra credit for chemistry class and have a little fun on the side, but the earlier creators of tintypes and platinum prints, Daguerreotypes, and ambrotypes had purposes of their own: developing new technologies, recording history, and exploring the artistic possibilities of an intriguing new medium. We hardly think of those early processes today. Accustomed to the beauty and ease of digital photography, we capture, catalog, and convey the wonders around us with an increasing and almost stunning thoughtlessness. Now that the whole of the modern world seems to be carrying a camera, it’s even easier to forget those early forms of photography, not to mention creative ways that earlier generations found to capture and share images of the world’s rich diversity. 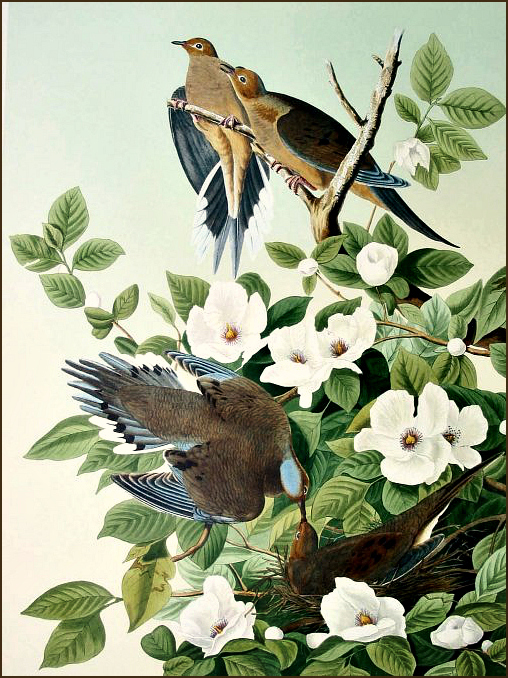 In the days before photography, Audubon was not the first person to attempt to paint and describe all the birds of America (Alexander Wilson has that distinction), but for half a century he was the young country’s dominant wildlife artist. His seminal Birds of America, a collection of 435 life-size prints, quickly eclipsed Wilson’s work and is still a standard against which 20th and 21st century bird artists, such as Roger Tory Peterson and David Sibley, are measured. While Audubon may have been the best, he was far from the only artist dedicated to accurate and aesthetically pleasing depictions of birds. Etchings and oil paintings were common, as were chromolithographs: an inexpensive way for ordinary people to enjoy birds as art. 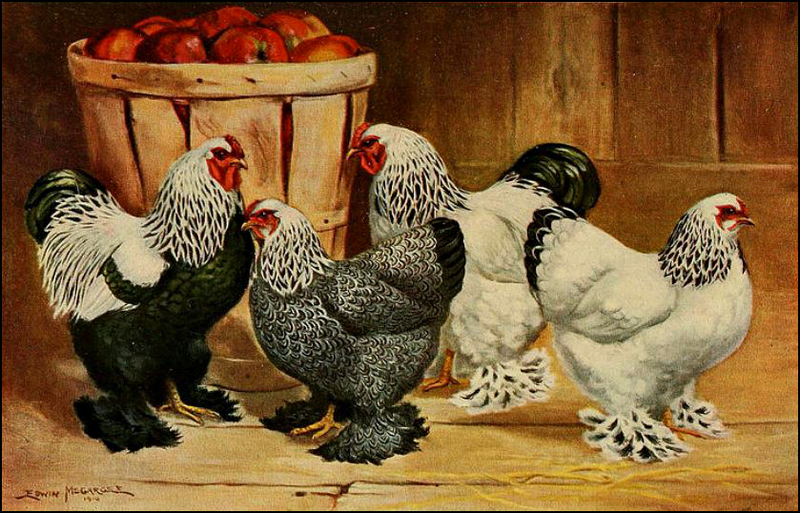 One of the most well-known examples, The Illustrated Book of Poultry, was published in 1890. Popularly known as Cassell’s Book of Poultry, it had text by Lewis Wright and illustrations by J.W. Ludlow. Unlike Audubon, Ludlow specialized in domestic birds. He illustrated several books devoted to poultry and pigeons published by Cassell and others between 1867 and 1886, and reproductions of his work can be found in as many country kitchens as museums. A multitude of other artists dealt in “fancy chicken pictures,” as my grandmother called them. Harrison Weir, A.F. Lydon, Ernest Whipple, Louis Graham, and Edwin Megargee are just a few of the artists whose works continue to delight. A friend in the Texas Hill Country has examples of Megargee’s art in his workshop, and a few matching birds peck around outside. Megargee’s work is especially interesting because of the role it played in the development of dinnerware as art. Pictures on plates were quite the fashion in early-1900s America, and images of birds were common. The work of Megargee and others was purchased by companies who produced the decalcomania (often shortened to ‘decals’) used by china manufacturers such as Homer Laughlin, Knowles, Taylor, & Knowles, Smith-Phillips, and a variety of smaller companies throughout the Ohio Valley and eastern United States, to decorate their products. Despite a period of chaos, the business flourished, and artists such as Megargee flourished because of it. Examples of their art still can be found. This Trellis shape plate by Homer Laughlin, produced in the 1930s, is an interesting combination of modern design and early 1900’s decoration. Like chromolithography, these decals allowed ordinary people to add beauty to their lives at a fraction of the cost of original art. Hand-painted Haviland is exquisite and a lovely table can be set with Limoges or Meissen, but around 1900 many mass-produced American products began to bring smiles, too. While the shape of the blanks (the dinnerware pieces themselves) was standard, decorators often were free to combine decals, decorations, and hand-painted trim as they chose. The results can be delightful. Certainly the plates of the lithographer or the plates hanging on a collector’s wall never will be able to capture the sweep of a rising flock, the osprey’s dive, the intimacy of the nest, or the necessary dinner of the predator in quite the same way as the best photography. But from Audubon to Ludlow, from the artist to the craftsman to the most anonymous worker on the decorating line at the factory, a necessary caution still applies. It is the eye, the heart, and decisions of the mind which make art — not technology. If we enliven those three, the art will follow. Comments always are welcome. The plates pictured are from my personal collection. How many plates do you have in your collection? I looked up the word decalcomania in the google machine. It returned a lot of images. One I found caught my eye I thought you’d get a chuckle from. I have ten of the bird plates. If you expand the category a bit, I could include a plate with seashells, one with rabbits, and a really big lemonade jug with an impressive fish swimming on its side. In addition, I have a small collection of items with decals or transferware images of women, and a nice collection of chamber set pieces. I used to deal in early American china on eBay, but gave that up more than a decade ago (about the time I started blogging, actually) and have kept only the pieces that are special to me: mostly art china and chamber set pieces. Your plates are really lovely! I still have my Brownie box camera 127 that I got as a little girl. I don’t remember ever having the manual. I wondered how hard it would be to find on eBay but I found a free download just now and a video that shows you how to use 35 mm file in those old camera! This post checked a lot of boxes in my memory bank. I love Audubon prints and I used to develop film in a college class and one of my favorite pieces of art in my house is huge watercolor print by Authur Singer of blue heron. I know you didn’t mention him but Audubon always reminds me of Singer’s work. He did 50 bird stamps for the post office too. I was surprised by how much information there is online about the Brownie cameras, until I realized there are people who collect cameras the way others collect coins or stamps — or dishes. I suspect you bumped up against some of the the same sites I did when I was browsing. The plates are delightful. For years, I’ve had a post in mind about the beginning of my passion for china collecting. As with so many things, it was a tiny trigger that started it, but it’s an interesting story that involves, of all things, my parents, and the history of a set of dishes in our household. I really ought to get to that. Thank you! It’s fun living with these lovely plates, and I enjoyed writing about them. I’m glad you found their history interesting. Loved my little brownie camera! My granny had a small collection of birds painted on plates, much in the style of Audubon. I have one I saved for my cousin (she has the mate). It is packed away now, but when I get closer I will see that she gets it. Now you have tweaked my interest to see who the painter was. Isn’t it fun to see how many of us remember the same childhood delights? Those cameras were wonderful — I only wish now that I’d kept some of those awkward photos we took. Long before I began photographing flowers, my preference in china collecting tended toward florals. Then, I started including birds and animals. There was some beautiful work done in the early 1900s and beyond; I’m glad that you still have your granny’s plate to pass on. Your mention of decals had me thinking: Well, you can’t cut food on one of those plates. Then I realized that they’re for decoration only. I’ve often wondered what the long-term health effects are from years of breathing darkroom chemicals. There’s no way to unbreathe them and compare the results. Just thought I’d suggest that hundreds or thousands of photographers with darkrooms are the living guinea pigs and answer to your question. I’d say more harm was done to their health by cigarettes and booze than darkroom chemicals. I hope you’re right, because that would favor me, who didn’t smoke and rarely drank but who breathed the fumes of photo chemicals for years. On the other hand, a lesser harm is still a harm. Actually, some could serve as dinnerware, depending on the production process. Some plates do have decals applied on top of the glaze, and those can be easy to spot: often because of scratches in the decal. Other decals were put in place, glazed, and fired again. In fact, much production dinnerware employed the use of decals. Here’s an example of the variety that was produced by just one company. Laughlin had dozens of dinnerware shapes over the years, and each shape was decorated with dozens — perhaps even hundreds — of designs.This shape is Eggshell Nautilus. If you scroll down a bit, you’ll find my parents’ wedding china on the left side; the pattern name is Dresden (N1679) and it, too, is decaled. I’ve wondered the same thing about a quarter-century of breathing varnish and solvent fumes. Of course, I have the great advantage of working outdoors, which minimizes the effects or even makes them negligible. I wonder if people who do photo developing today wear respirators, as people who work in spray booths do? Do you know what it was about the shape that suggested the names “eggshell” and “nautilus”? I see there are online discussions about using respirators and masks with filters to reduce the amount of inhaled photo chemicals. The name “eggshell” was given to a number of shapes when a finer, more delicate china was introduced in the 1930s. Technological advances (!) led to a product that was promoted as being lightweight, stronger, and craze-proof. In addition to Eggshell Nautilus, there was Eggshell Georgian; both of those shapes had been produced earlier, but were reintroduced with the addition of “eggshell” to their name. Some new shapes emerged, too; Eggshell Swing comes to mind. Georgian patterns were more formal, and recalled the Georgian period in English history. “Swing” was a smooth, rounded shape with simple decoration and more modern lines. As for the “nautilus” name, the original Nautilus shape had finials and handles that vaguely resembled a nautilus shell. Those changed when Eggshell Nautilus was introduced, but the backstamp continued to reference the shell. My literal mind is thinking that “eggshell” describes a plate’s material, not its shape. I assume the same material could be cast in many shapes. I’m wondering if in the world of decorative plates “shape” has a different sense from its usual one, a sense that combines shape and material and maybe even pattern. “Shape” in dinnerware has the common meaning: the lines of the piece. The pattern is what’s applied as decoration. Sometimes, as when a new material is introduced (“eggshell” china) the material name does get added, but it generally isn’t. There are exceptions, of course. The Wells shape came out with decals first, but then a new “art glaze” was developed, and the “Wells Art Glaze” line came in four solid colors — very art deco, and gorgeous. To my great amusement, this just occurred to me: “shape” and “pattern” are rather like genus and species. I can live with those last two sentences, but something critical, fundamental in photography has died and there is no way to get it back. And anyone conscious before the Age of Big Tech knows it. Of course, we need to remember that technology existed before the advent of computers and 3-D printing. When decals replaced transferware, there were moans and groans about the negative effects of that “new” technology. And when decorating studios filled with people hand-painting china saw transferware on the horizon, not all of them were happy. As for photography, there are people who make wonderful use of digital technologies, and just as many who use their camera phones mindlessly. Every technology is a tool, and results will differ depending on how it is used. Jeepers. “Moans and groans”? Kinda like me complaining about experiencing ageism and sexism denying my right to work? Changes, even those perceived to some as innocuous, can have long term genuinely devastating effects on individuals and society. I’m not whining about “the new”. I’m whining about the effects of the new on human life, heart and soul. They are little bits of beauty, aren’t they? I have four of my grandmother’s plates, too. They aren’t decorated with birds, but with yellow roses. When I see them on my wall, they take me back to her house. I’m glad you enjoyed these; I’ll post more about some of my china in the future. Happy weekend! I’m glad you enjoyed the plates. It delights me to see how people in earlier times brought beauty into their homes by decorating ordinary objects; a plate or two hung on the wall could work wonders for a room, and I suspect for their spirits. Hope you are well. I have 18 more days in The Gambia and haven’t forgotten about my hooded vulcher and bird trip update. Today’s posting has arrived at a poignant time for me towards the end of my Gambian experience. I really enjoyed reading it and can well remember my first attempts at photography, holding one hand over one eye. Since childhood I have been fascinated with family photographs depicting a bygone age. At annual family holidays from uk to mum’s Irish homestead I took delight in the ritual of looking through my aunts box of photos. The timespan was limited to later dates with the advent of people acquiring their own cameras. My late mother’s mother died when my mother was aged 8 years & she had no photographs of her. When mum was 90 yrs I collected all our old photos including some from the homestead and stuck them in an a3 art book developing a photo journal of her life. I found the process therapeutic. I plan to do this with all my Gambian pics since 2012 seperatingbthem into categories. Your last paragraph gives me reassurance that I am capturing ‘my’ experiences. I can imagine the pleasure that putting together the photo journal gave you. I’m sure you’re doing this, but indicate somewhere — on the back of the photo, or perhaps in the journal — the names of those who are pictured. We’ve spent a good bit of time going through our own boxes of family photos, and realized too late that we weren’t even sure some of the people were family. Now, so many are unidentified that we’re going through the process of sorting them again, and keeping only those we know or suspect to be part of our clan. I’m sure you’re having a wonderful time — and no doubt are trying to absorb every last experience before you leave. Even though most of my photos from Liberia faded away after so many years, my memories are as sharp as ever — though I would have enjoyed having a digital camera when I was there. I hope you’ll be sharing some of your photos. The photographs I have are identifiable people otherwise I would not be compiling such a personal journal. The decision to share my pictures is a personal one. I meant photos of your time in the Gambia, such as the birds, but of course the decision is yours. I’ve always been concerned with conservation of Nature (used to be called a tree-hugger actually), so I’ve enjoyed the work of the Audubon Society for a while, but this post is not only interesting, but beautiful. You’ve done a great job, Linda. I’ve thought several times about posting about some of my china, but just never got around to it. I chose the bird plates for a first post since even people who don’t care a lick about china usually like birds, and who doesn’t like Audubon? Beyond that, it’s tickled me to find so many people who also had one of those early cameras. Isn’t it funny that “tree hugger” took on such negative connotations for some people? I think it’s a perfect expression for the affection we feel for nature. My first camera was a Brownie. These plates are great! I think people are appreciating some of this “commercial” art more and more, just like it took a while to recognize N.C. Wyeth, Norman Rockwell, etc. as more than just magazine illustrators. I’m so glad you discussed how “mass-produced” has its upside – – not “more stuff is better” but because it allowed working people to have things that were comfortable, labor-saving, pretty, or even beautiful. When we look at colonial-era households, with wooden trenchers, etc. it can be monotonous and drab – we see the appeal of a simple, spare existence, but when industrialization began, it really seems like people were starved for color and design. “Just for Nice” as they say in Pennsylvania. I was in Albany a few weeks ago, looking at a big gallery of “Hudson Valley School” paintings – – one of the rules for these beautiful vistas seemed to be “You gotta have a cow”. Painting after painting showed mountains, the majestic Hudson River, florid sunsets and towering clouds – -and cows. I think cows instantly registered to viewers in those days as “The Good Life” – peace, tranquility, prosperity. And I think those “fancy chicken pictures” meant the same thing, too. A Sunday chicken ‘n’ dumpling dinner was the big deal for my grandparents. 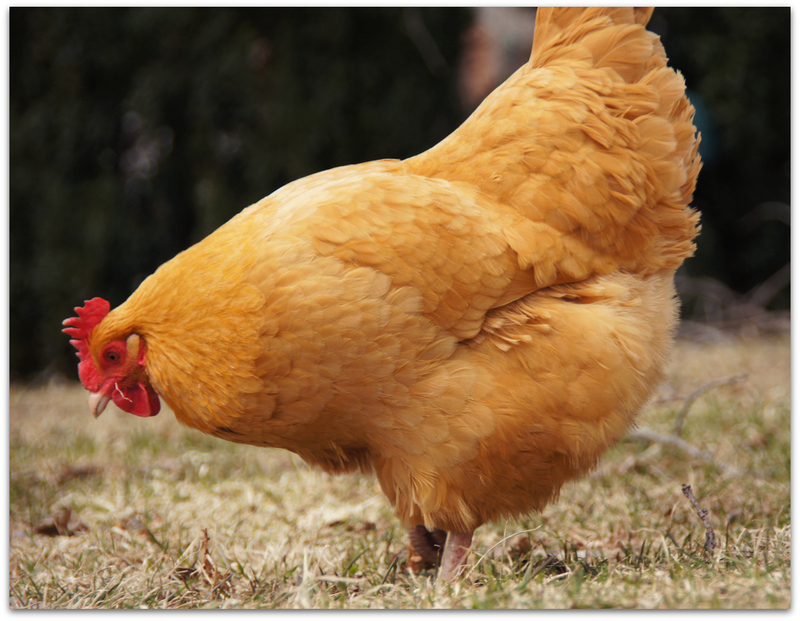 I’ve also learned, from seeing the 4H kids at the county fairs, how absolutely stunning some chicken breeds can be. Rhode Island Reds kind of dominate, but when you see some of these Silkies, etc. they’re really knockouts. I can think of so many ways that my grandparents included those bits of beauty in their home: not only decorated plates, but hand-made lace on sheets and pillowcases, flowers on the table from the cutting garden, and so on. I have the pressed glass oil lamp that sat on their sideboard, and a few other miniature oil lamps I’ve picked up along the way. The art glass fairy lamps from the Victorian era are just for very, VERY nice — I’d love to have more, but they’re pricey beyond belief. The last one I drooled over cost more than a good wide-angle lens. When you go back even further, to the days of chamber sets, some of the decoration is fabulous. If you’re going to be washing with a pitcher and basin, and have a chamber pot tucked beneath the bed, it might as well look nice. Your comment about the cows intrigued me. I’ve never connected the Hudson River School with cows, but sure enough: here’s one. As for chickens, I get my eggs from a flock of buff Orpingtons They’re darned fancy chickens themselves. I didn’t know what a fairy lamp was, but looked it up, and saw some nice embossed ones, I can see why you like them. I like those “lithopanes” too, and see that Samuel Colt (the revolver guy) collected them, and they’ve got his over in Hartford, CT at the Wadsworth Atheneum, so I’ll have to get over there sometime. I also didn’t know Buff Orpingtons, but that’s a very handsome bird. And should some accident befall them, they look like they’d make great feather dusters! I so enjoyed reading this post. I really like how you went from the photo processing era back to the hand drawn delicate images by artists. The description of the photography development in high school brought back so many memories to similar experiences that I had and actually loved. It was like magic to wait for that piece of paper in that mysterious solution to create the image you captured earlier.Your words are so descriptive and evocative, it took me right back! We were just talking about that fact that, years back when there was no digital photography, few people carried cameras with them. Even on trips or travel, only people willing to invest time and effort and money to print photos had cameras. Now of course, every one can take photos on their cameras and there is no added cost or effort. I kinda miss those days. We had time to wait, in those darkroom days. And if we were impatient, as most of us were in our youth, we learned something about how to wait, as well as something about photography. It certainly was magical, seeing those images emerge. It was like watching the shape-shifting of clouds, or the slow rise of a fish in a pond. I still love those “analog days,” and the slower pace of life then. Of course, I’m sure the pace of my life would drive some people crazy. I’m a great lolly-gagger, even though I can keep to a deadline when I need to. While there’s less financial cost to photography today, I’m not sure I’d say there’s no cost. One of the most thought-provoking essays I’ve read is “Click Fix,” by Marc Barnes. It’s not particularly long, but it’s intriguing, and helped to explain certain behaviors I see around me. It occurs to me that the people he’s writing about might rarely have the kinds of experiences you and Ben often have, or the photos to go with them. I have Audubon’s book Birds of America. it was one of the ones soaked by the flood but I kept it anyway. it did not have glossy pages and so the illustrations did not stick together. the pages are a bit wavy now but they did dry out. and I’ve seen many examples of the decal plates those five years I worked at the antique store and the frequent estate sales my sister and I go to. I remember the day you mentioned how many of your art books were damaged by Harvey, and how sorry I was. I’m glad the Audubon book survived, even if damaged. I can look at his images for hours. Like botanical drawings or your sculptures, his art reveals nature in a way different than a photo. I’ve almost stopped browsing antique shops, but it is fun now and then to see what they have. My discretionary income goes in other directions these days, but I’ll probably give in if I ever find another really good bird plate. As a former journalist, photography was one of the classes I took in university, and your description reminds me why I’m delighted that technology has advanced past that! I recall standing in a tiny, dark closet-sized room with the sound of water running continuously. I remember having to open the film canister in total darkness. I remember most of what we took were photos in black and white. But today, we get to see instantly if the shot is a keeper, and we get to see it in living color! And we can view it on the camera itself, on a computer, or print it out for sharing. Wow! Thanks for the memories, dear Linda (and your plates are stunning). The memories we have that are connected to our senses certainly do linger, don’t they? The darkness; the running water; the smells — photography was a different art then. It’s been interesting to read here and there about people who are going back to film photography. The film vs. digital debates can grow a little snippy, and sometimes they remind me of discussions between cruising sailors and those who prefer to race. There’s a place for both, of course. When it comes to photography, the truth is the affordability of digital photography is part of its attractiveness, once the initial investments are made. If I were having to develop all of my photos from film, it wouldn’t be happening. As it is, all of those advantages you mentioned are part of today’s photography — and thank goodness for it. I, for one, am so thankful for digital photography because I can see immediately if a shot worked out the way I wanted it to. Back in the early days of our marriage, hubby and I purchased a 35 mm camera because I was always so disappointed with photos I took with less expensive automatic cameras. We then both took a photography developing class as well. During my years as a newspaper journalist, I often had to venture into the darkroom to look at pictures the staff photogs were developing to go along with my stories. Now, I would get very claustrophobic in those darkrooms! Your post was so very interesting, and I loved the photos of your collectible plates. I like being able to see an image immediately, too. On the other hand, I’ve learned not to delete anything in camera. I always wait until I get home and see the photos on the computer. More often than not, the images I imagined were worth keeping aren’t, and there always are surprises in some that I couldn’t see when viewing them in the camera. That’s part of the fun: the surprises that always are there. I’ve experienced a touch of claustrophobia from time to time, but never in a darkroom. Perhaps it’s because I spent so many of my early years tucked into my bedroom closet at night, using a flashlight to read my books. I got accustomed to that small, dark space. I’m so glad you enjoyed the post. The plates are lovely, aren’t they? So many of the homes I remember from the 40s and 50s had those decorative plates on the dining room wall, and a pretty calendar in the kitchen. Oh, I so agree about waiting to see the images on the computer. I’ve experienced the same thing. Sometimes the shots just don’t look as good on the computer screen as they did in that small viewing window of the camera. And I love those little surprises you find too. I too remember decorative plates. Do you remember the tea towel calendars? I not only remember the tea towel calendars, I still have a couple that belonged to my mother. We always used them for drying glassware — they were absorbent and lint-free. Now, I see them once in a while, but the fabric has changed; it’s probably some sort of blend, and isn’t so useful. A good tea towel is a thing to be cherished! The plates are magnificent and you are fortunate to have those of your grandmother. I have china but the pieces are from the 20′ or 30’s and not of anything special. Just some design- I think of flowers. Got the set at an estate sale. Now packed away- waiting for me to get a carpenter to build a large cabinet to hold my collections of various dishes and things that I love. I want that before I die so I can look at them every day. I have a Brownie camera as well and it too is stored in a box. I wish I could use it again but there is no film for those old cameras and no one that develops that I know of. Great post that I found very interesting. Actually, if you wanted to pursue it, there are places where film’s available for the Brownie. Here’s one page that has links. There are a good many videos about how to get those old cameras up and running, too. While I was poking around, I was interested to find several posts by people who went back to those simple old cameras as a way to hone their digital photography skills. One even was building his own darkroom. That’s real enthusiasm. 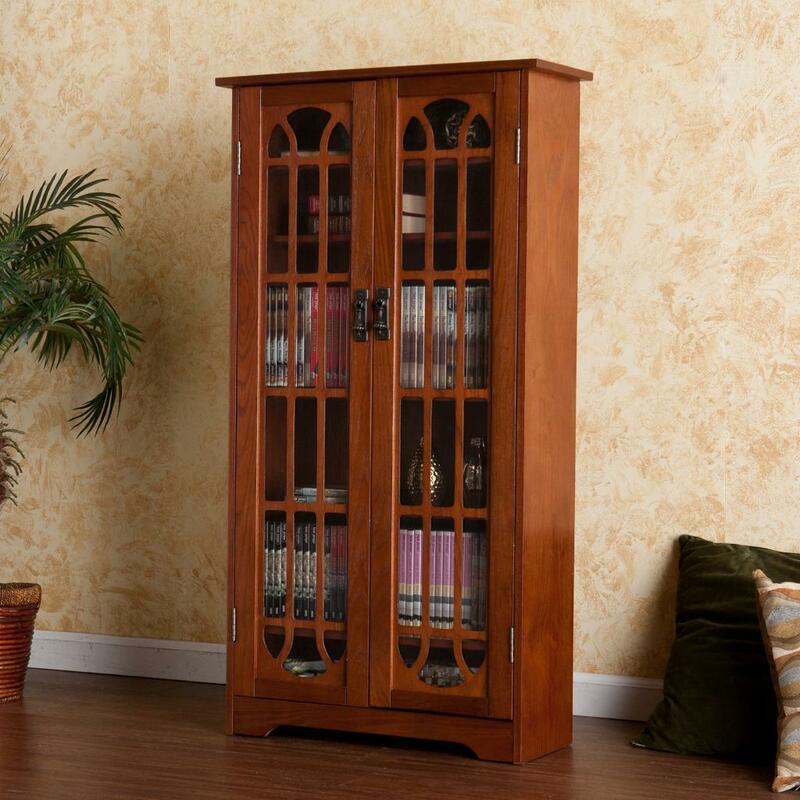 I solved the display issue in part by purchasing a pair of Mission style media cabinets, sort of like this. Mine are 8″ deep and 48″ high, and they’re just perfect for much of my china: especially chamber set pieces, spooners, and such. Even better, they’re small enough to fit into my dining area. Another option I’ve used is wall-mounted crown molding ledges. They can fit into small or unusual spaces, and helped me get a lot of things out of boxes. When I was culling my collection, my goal was to get it to the point where I could display everything, and not have anything boxed up. Knowing that I’ll eventually have to move into a smaller place, there will be more downsizing to come. What struck me as I read your opening on simple cameras, home and school darkrooms and even the drugstore vacuum tube testing station (I remember that well) was the high cost of entry into most technical areas. When I say cost, I am talking about the investment of time and study as well as money. In the early days of computers and electronic design, we had a thing called desk-checking where you poured hours and hours into checking syntax and structure before punching your instructions into code and submitting them for compilation. Even meager success required a great deal of preparation, time and patience. I am not saying this is better or worse but it is part of what differentiates the culture of then and now – and because of that, the organizations of the past tended to be more brittle and rule driven. This isn’t directly related to your comment about desk-checking in the past, but some of the clips I saw from Mark Zuckerberg’s testimony yesterday made me smile. The generational/technological gap was on full display (among other things, like Senatorial grandstanding), and a little time and study before the hearing would have served the Senators well. On the other hand, a little less snarkiness from twenty and thirty year old commentators might be in order, too. I have some sympathy for the Senators, having spent the better part of Friday night trying to get a new keyboard cover to start talking to my iPad. Only when I cruised into the Verizon store on Saturday morning and watched the tech get my Bluetooth connection up and running in five seconds did I figure out the problem. The instructions said, “Press the bluetooth button until the blue light comes on.” What it should have said was, “Press the bluetooth button until the blue light comes on, stops blinking, and stays on.” Details, people! Facebook holds the same view of manners and courtesy as my fictional character Stan. Asking a friend to help you fix your car does not give them license to enter your garage at will and take anything they want. Knowing Stan as I do, I’d say that’s a perfect metaphor. I’m not surprised that you were a camera collector and film developer, as well as a photographer. Despite being introduced to the finer points of photography, I drifted away, and never used a camera much after high school — except on vacations. When I moved to Liberia, I did take a camera, and took scads of photos, but unfortunately most of those have faded away. I’m sure part of the reason was poor developing in Monrovia. Ironically, the reason I got back into photography was eBay — I needed a way to post images when I started selling china on the site. I picked up a cheap Canon, and when it finally gave up the ghost, a friend gave me her Canon PowerShot. By that time I was blogging, and wanted to be able to post my own photos rather than going through the complexities of finding images on the web or asking permission to use other people’s. The rest, as they say, is history. I got interested, got a decent camera and a couple of lenses, and started paying attention to birds and flowers. I don’t have to tell you how much fun it is! “It is the eye, the heart, and decisions of the mind which make art — not technology. ” I’m in total agreement , here, Linda. First and foremost, photography is about the ability to ‘see’ photos. A bit of training helps, as does taking lots of photos. We flew off to Liberia with our Brownie in 1965. Most of my Liberia photos were taken on it. But we also had a Polaroid. The kids were entranced with the Polaroid, and just a little bit afraid of it. It’s true, Curt. Just as we learn to write by writing, we learn photography by taking photos. Books, tips from others, online courses, and manuals certainly help, but there’s nothing like just getting out and doing it. I wish now I’d had a Polaroid in Liberia. It would have been useful, I think — although the issues you hinted at were real. The upcountry folk were not stupid, but they had beliefs that had to be taken into account. Two that I remember — apart from cameras capturing a person’s spirit — had to do with electric lights (some patients refused to go into a room when one was on) and eggs (unacceptable for pregnant women). On the other hand, most of my students loved having photos of themselves, and one had his own camera — he was the class photographer. The plates are charming and this was all new information for me. I have some old floral plates (my in-laws were avid antique collectors), though nothing of the sort that you’ve written about. As for the darkroom, I only have vague memories of my older brother in a darkroom as he’s always dabbled in photography. I have some floral plates and pieces, too: primarily poppies, pansies, and roses. Since becoming interested in native plants, I’ve wondered from time to time whether any of ours have been used on older dinnerware or china. I do know that HEB is selling sets of bluebonnet dishes right now — I had to laugh when I saw those last week. I was surprised to find so many sites devoted to film photography. I did follow a blogger for a while who used only older films, like Velvia. Her photos were amazing, but she eventually gave up film photography and developing because she and her husband had twins, and life got complicated. Audubon set the bar pretty high. I have the Roger Tory Peterson “bird book” — and Walt Kelly’s send-up of it which he called “Captain Wimby’s Bird Atlas” in the memorable story ark concerning the time two of the bats were flying the third as a kite, his suspenders broke, and he was blown, sans pantaloons, into a grackle’s nest and crunched the egg therein. The mama grackle came back and thought he was what had hatched from her egg. and had to consult “Captain Wimby’s Bird Atlas.” so he could be properly identified and thus she would know what his bird call should be and what to feed him. 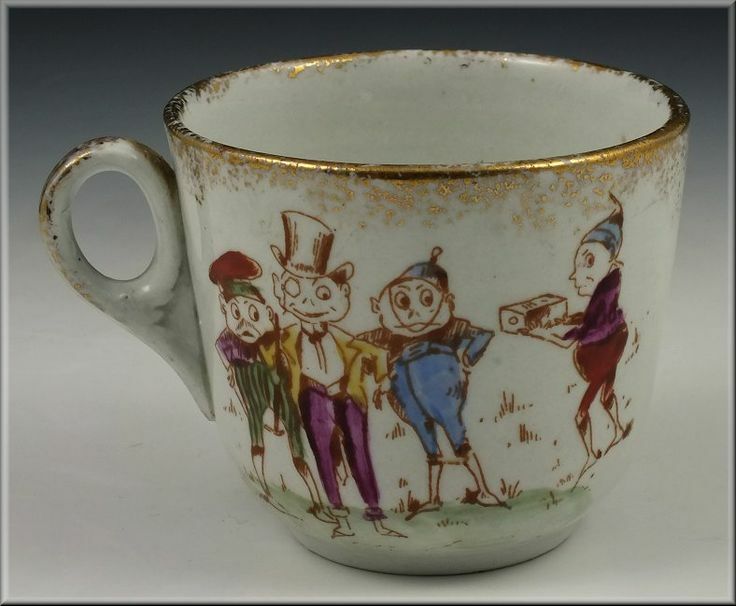 The advent of transfer ware made it possible for china embellished with pictorial designs to be mass produced and thus become available to those of more modest means. I have a Staffordshire tea set with transfer ware scenic designs, and, of course, my beloved Churchill Blue Willow Ware dishes. There is a certain “farm house” vibe in interior designs that lends itself to these “chicken prints” and I have seen this pulled off well in some kitchens. A set of dishes with well-painted transfers of avian subjects could bring an air of elegance to any table, even if one of the Sears 1950’s chrome and plastic laminate “dinette” tables was underneath the white linen table cloth. There was a time in my brother’s salad days and in the early years of his first marriage when he was into black and white photography and had a variety of cameras and a darkroom set up in his basement. I have some of his prints which I received as gifts, and treasure to this day. Your knowledge of Walt Kelly and his characters is astounding. I’ve never heard of Captain Wimby’s Bird Atlas, but I have a sense that acquainting myself with it would be worthwhile. When I looked it up, I discovered that one of Kelly’s strips, in 1953, portrayed the re-writing of the Atlas as a form of censorship, and a sly example of the repressiveness of the McCarthy era. Cartoonists always have pushed the boundaries a bit — at least, the good ones do. My oldest pieces include some transferware, and despite their simplicity, they’re quite nice. A few are English rather than American; they’re earlier, and far more sophisticated: probably like your Staffordshire. I like the brown and white best; I’ve seen black and white, but they’re pretty scarce. I’ve never had any Blue Willow, except when I was a kid, and had a small set of tin dishes with a sort-of Blue Willow pattern. They helped to serve up some of the best mud pies in the world. There is something special about a photographic print, isn’t there? A framed photo on the wall is qualitatively different from an image viewed on a computer. Both have their place, but prints are special. I’m not so fond of black and white computer images, but I have had black and white prints that were special. I’m glad you have some of your brother’s. My first camera was a Kodak box, after which I bought an Agfa Clack. Some years ago I had a dark room in which I developed my own photos. I can still feel the excitement of getting my first film back from the photo camera shop where I took my first black and white roll of film. It would have been 1953 or so. While clearing out drawers of papers I came across the Certificate of Printmaking. Not sure what to do with all the prints I made on a gigantic etching press available at the technical college where I did the course, together with some lithographs. Give them away? Thank you for your lovely post, Linda. Always inspiring. We each were getting our first exposure to photography at about the same time. It was exciting to get those photos back from the developer. As I recall, it took several days. I do remember when 24-hour developing became common; there was a good bit of excitement about that. And I suppose everyone did what we did in the beginning: sorting through the photos to see if any deserved reprints. If one photo was especially good, we’d find the negative and head back to the store. We never asked for duplicate prints in the beginning, because we knew the proportion of good photos would be pretty low. I didn’t know that you did your own developing, too. I suspect you were good at it. And how interesting that you also did print-making. What subjects did you prefer? Did you learn it for business, or pleasure? Perhaps there might be a blog post there – it would be fun to see some of your work. Beautiful plates, I still can’t change a memory card on a digital camera without looking for shade!! That really made me laugh. I’ve never had to change an SD card outdoors, but now I’m wondering if I would have instinctively headed for the shade. Clearly, I’m not taking enough photos! You had me at the brownie camera “hook,” not to mention, though for me this came later, the evocation of the sights and smells of the darkroom. And of course I love the “turn” you take toward Audubon to arrive at decal plates, about which I knew precisely nothing. Thank you for filling in the blank in the middle of the plate. I’ve discovered that the Brownie cameras were produced over such a long time, in so many versions, that more than the usual number of people have had experiences with them. 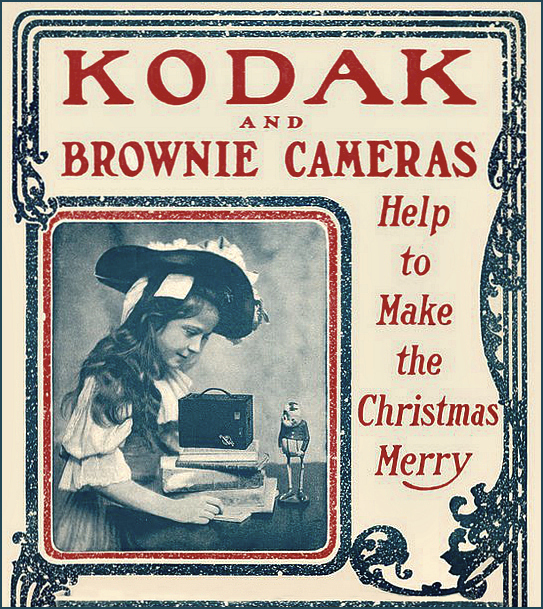 What I didn’t know until about ten minutes ago is that the camera was named after the Brownies developed by Palmer Cox: they were characters in children’s stories in the late 1800s, and incredibly popular. There’s some interesting history here. I’ve known precisely nothing about Cox’s Brownies, and I wondered if there might be some children’s dishes decorated with them. Of course there are! Look at this. There were entire sets of children’s dishes decorated with the Brownies. Do you suppose someone took a photo of their child eating from a Brownie plate — with a Brownie camera? There is apparently no end to the journey of discovery here! I hope someone does come up with the photo you describe. That would be the cherry on top, for sure. Despite all the bells and whistles resulting in some interesting images, old fashion film and developing in trained hands is extremely high craft and art. Both have a place – all depends on goal and objective. (and probably time?) How lucky you were to have experience in the darkroom. Those Brownie cameras (with gears and teeth) opened the door to a magical world for many. I think there are some constants between film and digital photography, and the time required for proficiency is one. There’s a lot of mindless clicking going on these days, and a lot of processing that isn’t at all artful. I know some photographers whose work is stunning: more like painting than photography, and as compelling as anything produced in the film era. But they aren’t wandering around with only a camera phone, or only applying pre-packaged filters. I was lucky to have that darkroom experience. In my era, schools provided a rich environment for learning, and there was a good bit more hands-on than there is today, I think. At least, our hands were on my than computers and mobile devices. Fascinating post, Linda! I enjoyed seeing the progress of the art. Wish I had a few of those pieces now too! The pieces you really would enjoy are a couple of old hand-painted plates I have. Both are done in shades of brown. One shows a rabbit in snow drifts along a creek, and the other has snowdrifts, a shed, and trees against a sepia sky. The shed is truly beautiful, but even the rabbit is quite good. The plate was manufacted by Harker Pottery in East Liverpool, Ohio, c. 1895, and it was given as a premium by the Eaton Grocery Company in Eaton, Colorado. I’ll post photos of them one of these days. I have two pieces of a chamber set that are even older. They’re decaled, but the scenes could be rural Montana. Both have mountains, flying waterfowl, and such. It’s funny how happy it makes me to look at them. I relate to these. Husband used to develop black and white in our guest bathroom. That made me laugh — and laugh harder than I might have otherwise, because I have an acquaintance who tans deer hides in the tub in her guest bathroom. It just proves how much creativity can emerge from those empty spaces in our lives — a good reason to keep a little space in our minds and hearts, too. I found this fascinating! I only know the Brownie having seen them in antique stores. I grew up in the Instamatic camera era. I was eleven when I got my first one for Christmas. I wasn’t done laughing at the previous comment when I started laughing even more at yours. If Brownies are in antique stores, I guess that makes me an antique, right? Actually, no true antique dealer would have me, because the general agreement is that 100 years or older makes an antique. Otherwise, things are called ‘vintage,’ or ‘collectible.’ But old is old, and me and the Brownie are. I’m perfectly fine with that! I had an Instamatic, too. I can’t quite remember when it came into my life, but I’ll bet it was 1964. Our high school band went to the New York World’s Fair that year, and I probably received it as a graduation gift before our trip. What I remember most is the ease of loading the thing. It was progress, for sure. My first camera was a nice German one someone forgot on the Lurline. My uncle brought it homw to me. Later I became interested in photography and now have a closet of old film cameras. My great grandfather curiously, was quite interested in photography and experimented with many types of printing including some on linen cloth which were very interesting. That’s a camera with a story, for sure — even before you took a single photo with it. Did you collect cameras for their own sake, or did they simply accumulate over the years because of your interest? In either case, that’s no doubt quite a treasure you have. Some time ago, my beloved Canon acted up and had to go to the camera hospital. The place is in Houston — a tiny house tucked between multi-story buildings — but the family that runs it repairs film cameras as well as digital, and had examples of the famous ones in their shop: Leica, Hasselblad, Pentax, and so on. Apparently the bulk of their business relates to professionals, and they certainly use film more than the average point-and-shooter. It seems that printing on fabric is almost commonplace today. I’ve read about quilters who use the process. But in your great-grandfather’s time, that must have been quite unusual. Do you still have any of those linen prints, or have they faded away with time (one way or another)? I’m going to forward this to my wife. She got seriously into photography in the 1970s, long before digital technology. Digital cameras have amazing capacities, and enable those with little training to take great pictures. But I think the older technologies provided more of an outlet for artistic vision. I hope she enjoys the post. I don’t have enough first-hand experience to judge properly, but I’m inclined to think you’re right about the value of film for artistic photography. On the other hand, I know a few who shoot in RAW, and talk about the way the ‘digital darkroom’ functions much as the film darkroom did. There’s still occasion for burning and dodging, and all of the other things that add so much to an image. It’s wonderful to have so many choices today. “It is the eye, the heart, and decisions of the mind which make art — not technology. If we enliven those three, the art will follow.” Such true words! I love the idea of “enlivening” them. We need to feed our souls to make art. Methods always come second. It didn’t occur to me until I read your comment that “enlivening” is much like the somewhat old-fashioned word “quickening.” Both certainly could apply to that first stirring of artistic impulse, or first sense of creative movement. As for methods and artistic sensibilities, I wonder if there isn’t a reciprocal rather than a sequential relationship between them: as there is between experience and reflection. We begin with an artistic impulse — to draw a tree — but have to choose a medium. Then, the medium itself demands a certain discipline, which in turn reveals new possibilities. That’s part of what makes any creative endeavor so satisfying — there’s really no end to it, only different and more skilled expressions. Yes, I suspect it is as much reciprocal as sequential, and sometimes it is the medium itself which is inspiring. That is why I so like wandering about art supply stores, I think. I enjoy art supply stores, too — and I’m not even an artist! It’s that palette of potentialities that gets me. Well, and all those luscious colors! I used to always be very selective about which pictures I took, because I didn’t want to waste film. I also used to think that film processing was expensive – and occasionally won’t get a roll developed if I didn’t think that any of the photos would turn out well. I think all of us experienced that to one degree or another. Both issues — the limited number of exposures on a roll of film and the cost of developing — were always lurking around. No one wanted to use up their film by day three of a seven day vacation! I can’t remember intentionally deciding not to develop a roll, but we have had a surprise or two when someone in the family discovered undeveloped film still in a camera, or tucked away in a drawer somewhere. Boy howdy, did digital photography impact the news biz. Tours of our little shop used to include a peek into a no-longer-used darkroom filled with equipment that induced “oohs” and “aahs” and endless questions on how it was used. I came into the biz as the transition occurred, with part-timers doing the dark-room work, one of them them smuggling wine bottles into the space. I struggled with the developing digital camera stuff. Recent remodeling, though, erased the darkroom area, where now a digital press clicks, clanks and clatters as it prints digital type and images for our customers. For some reason, the smuggled wine bottle reminded me of the old darkroom jokes that made us giggle more than fifty years ago. Imagine my surprise to find them still alive and well, posted as memes on various sites. I had no idea there were photography cartoons, either. I just spent a great fifteen minutes laughing at those. It’s interesting to think of tour groups at a newspaper office. Were they school groups? Other newspaper people? I’m thinking non-news-pros, since anyone in the business wouldn’t be questioning the uses of the darkroom. When I think about how much has changed in the past decade, let alone the last half-century, a kind of vertigo sets in. It’s becoming more clear every day that the same lust for money and power that pervades politics is part of the tech world, and the results range from iffy to flat bad. Tours were mostly Cub Scouts, home-school groups, college journalists. The kids always dropped their jaws seeing the web press. Sometimes the press would be running, and they’d hold their ears. I have a friend who’s an associate editor of a paper here in Texas, and her comments are similar to yours. The pressures are real, and increasing, and not only financial. The days of the interesting, and thought-provoking, editorial pages filled with letters to the editor seem to be over. Being offended has turned into an art, and worse. Who wants to deal with that, especially when there’s the satisfaction of online flame wars to be had? On the other hand, I have read of papers that are finding new subscribers and advertisers precisely because what’s local and “ordinary” is appealing to more and more people. Little League, garden clubs, and fund-raisers for an injured firefighter may not be the Kardashians, but — they aren’t the Kardashians. For locals, the bread and butter is local, indeed. There will always be a place for that. This is so true!! How capable our –essentially a computer–cameras are! Point at something beautiful and let the camera do its thing and likely you will have beautiful capture. The only thing that can exceed that is simply human vision and what to do with all that technical capability. I enjoy the digital realm simply because my computer is a dark room I never had before. I can still remember having to practically sell my first born to get a camera shop to crop an image the way I wanted let along enhance anything artistically. Easy to take it for granted now. I suppose thought that the hunt for the right image is as ongoing as the hunt for the right word. Typing on a computer over hand writing is no more enough than using a digital camera over the wet lab. That is the one thing technology can’t give us…vision…only tools to implement it. And so we search!! Early on I appreciated Audubon’s art in a rather academic manner. It was only after I started shooting birds and learning their details and behaviours that the magnitude of his accuracy and beauty hit me. He was definitely above Willson in artistic talent to me, although Wilson has his story too. In fact I think Audubon’s art was oddly stylish and modern considering how long ago he worked. I take particular pleasure in thinking of my camera viewfinder and a portal to a world of birds he saw. Lets hope with conservation we can keep that portal open. I mentioned to someone recently that it’s taken me all this time to make the connection between the terms for the old-fashioned darkroom and today’s digital lightroom. It’s so obvious — but then, the obvious is what we so often miss. I’ve not yet found a way to write about one of the most striking experiences of my young photographic life. I watched a couple of women walk down a boardwalk at a nature center, yacking with one another while they took photos with their smartphones, holding them out at their sides. They never stopped walking, and the never stopped talking. And they never looked at what they were photographing. I really resonated with your comment about the camera as a portal through which to view the world of birds — and everything else in the natural world, for that matter. While my desire for a polished presentation — perhaps even artistic — certainly exists, the pure fun of it all is simply getting out and recording what’s “there.” I am coming to agree with something you said some time ago: the camera does help open our eyes to what’s around us — if we let it. A fascinating post, I did enjoy it. It is wonderful that so many now have the chance through technology being more affordable, to practice photography but as you say there is more to it that clicking a button. A friend and I were talking yesterday about how grateful we are for today’s technology, and the variety of cameras available. I had my DSLR with me, and she had an iphone with an attachable telephoto lens, but both of us loved knowing that we could review and cull photos to our heart’s content. The biggest difference between our approaches is that she culls photos right away, while I always wait until I’m home and can see them “writ large” on the computer. Otherwise: being able to snap away without worrying about developing costs is wonderful. I’ve always thought that I should share some of my china collection, but mostly haven’t done it. A post I’ve pondered for five years or more may finally show up this year. I’m glad you enjoyed seeing these plates. The plate collection with the birds by Megargee is lovely. What I’ve also noticed since I’ve been here is the use of old botanical drawings on plates. I find it way more charming than a photograph, and certainly more available for the public to enjoy. In P.R. there is a high demand for decals of game fowl (gallos de pelea), as cockfights are legal there, and the fowls are very showy. I wrote two blog posts denouncing the barbaric practice. When I was out and about yesterday, I saw two of the showiest roosters I’ve ever seen in a backyard pen. They were keeping company with some hens, though, and most certainly wouldn’t be used for fighting, as cockfighting’s illegal here. There is one very interesting legal loophole that was designed for a specific purpose, but trying to use the loophole’s not been very productive, as this explanatory and quite humorous article makes clear. I enjoy older decorated plates immensely, although pitchers are a nice way to collect bits of history, too. Roses seem to predominate, but you can find everything from tiger lilies to chrysanthemums, especially among the hand-painted examples, where personal choices can be made more freely. Well, cockfights go back as far as 6,000 years ago. I’m sure the practice must go on even for “medical reasons” as the article humorously explains. I like the idea of getting plates with old botanical decals on them. They don’t have to be vintage, though. You know how much I love photography, and thus would be expected to know quite a bit about the process’ history. I do, but I never read much about the processes that were temporary with the development of photography such as the painting and chromolithography you describe here. So I enjoyed this post very much. On a different note, I did start out my own photographic career with a Brownie, too, although back then as I boy I didn’t know it would lead to a career. I’m glad you enjoyed the history, Otto. My interest in china developed, over time, as much for the history as for the objects themselves. You can learn a lot by tracing the development of any craft, whether china production or photography, and I learned a good bit while collecting. Apart from the sheer interest of it all, I sold items as well as buying them, and needed to know their history in order to list them. It was great fun. It tickles me that you began with a Brownie, too. How old were you when your interest really began to develop, and you knew you wanted to make a career of it? I suspect it must have been fairly early in your life, even if it began casually. I got really interested in photography when I was around 12 or 13, but not until I was in the late 20’s did I think about pursuing it as a career. I’ve come back to this one several times but it was so rich I kept re-reading! Much I identified with — the Brownie as a child; the darkroom my parents had that I, too, used for extra credit in science class. And then the birds! And the dishes! Oh, my — how I love Audubon. We have some prints (probably from calendars) framed in the cottage and yes, we even have some old Audubon calendars we took when they were closing out Minisa at Torch Lake. And the plates. I don’t have those (you have quite the collection!) but plates were a big thing in our family and I remember mom buying pieces that had been made from blanks. I love the birds so much. Fourth in the Toledo Museum of Art’s biennial exhibitions focused on bird-themed art, the exhibition coincides with local birding festival the Biggest Week in American Birding, which brings tens of thousands of birders to the area to observe the spring migration of songbirds. It will be the first time that the Toledo Museum of Art’s first edition of Wilson’s pioneering multi-volume publication has been exhibited. Finally, these words will stick with me — I may have to print them out: ” It is the eye, the heart, and decisions of the mind which make art — not technology. If we enliven those three, the art will follow.” Bravo.